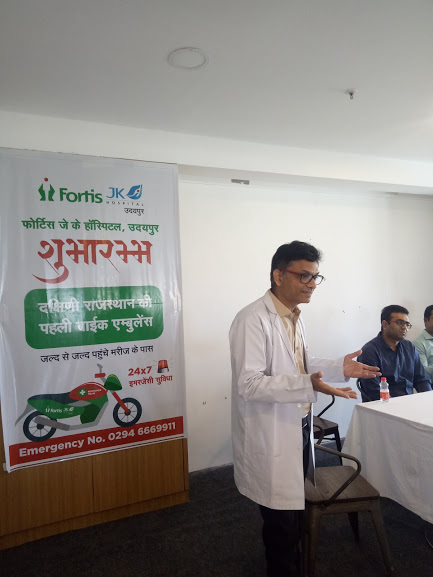 Fortis JK hospital has introduced the first bike ambulance service in the southern Rajasthan. The idea to introduce such a service is to decrease the response time post-mishaps. The decrease in quick response time will play a significant role in saving a person’s life. The service was inaugurated by SSP Gopal Mewara, Parbat Singh, DYSP, Traffic Department, Udaipur, Facility Director Retd. Col. H.S. Bhagat, Senior Cardiologist Dr. CP Purohit, Medical Director Dr. Tarun Vyas, Dr. Sandeep Bhatnagar, Dr. Mani Bhatnagar, Director Aman Chhabra, and Marketing Head Kalpesh Chand Rajvar. The bike service was started keeping in mind the geography of Udaipur. Localities like Ghanta Ghar, Hathipole, Maldas street and other areas of the old city are too crowded and have narrow lanes. This makes it difficult for a 4-wheeler ambulance to reach the spot in time. Bike ambulance service will make the first aid quicker as compared to the other services. The bike service will be available 24 hours on call at the emergency call number 0294-6669911. The service will cater to the medical emergencies within 10 minutes of the call received. 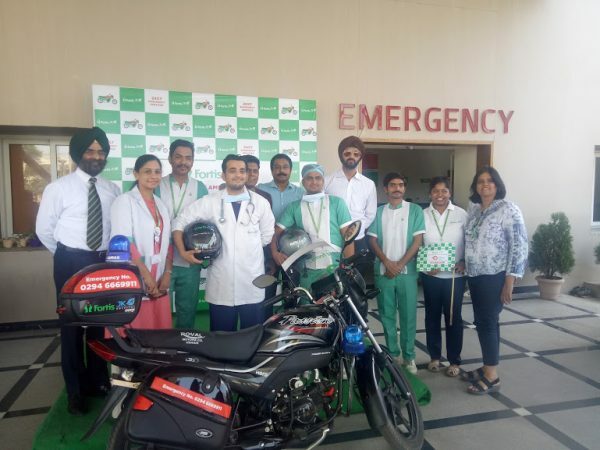 The bike ambulance is equipped with an emergency kit, medicines, and a trained doctor. The service will provide immediate first aid to the patient before transferring him to the hospital. A rally was carried out to make the people aware of this special service which included 100 bikers spreading the message. The bike ambulance facility will be available up to a radius of 25 to 30 km in and around Udaipur.